A repository of 47 million research papers is playing a game of internet cat-and-mouse with publisher Elsevier. Last month, Sci-Hub was forced to relocate to the sci-hub.io domain after its previous home at sci-hub.org was shut down when Elsevier won a preliminary injunction against it. Likewise the addresses libgen.org, bookfi.org, elibgen.org, estrorecollege.org and libgen.info – all of which were named as codefendants in a case brought in New York – have been taken offline. Why is Elsevier so upset? Sci-Hub hosts millions of scientific papers for free on the web – papers copied from Elsevier's stonkingly expensive online archives. A pre-trial set for January 20 was set back to March 17 after Elsevier wrote to the judge highlighting that Sci-Hub was using new internet addresses to host its enormous dump of research papers. 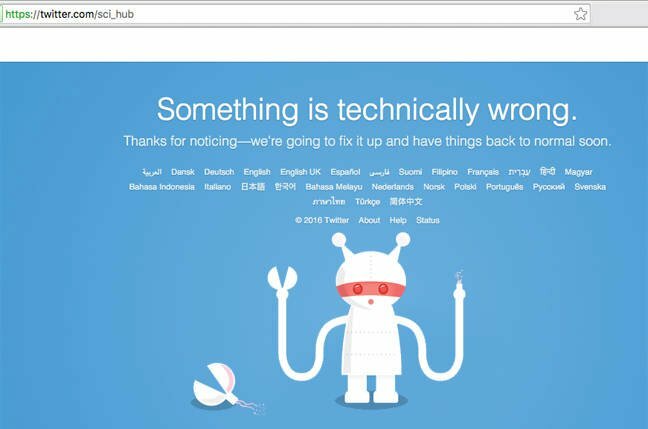 And on Friday, the @sci_hub Twitter account repeatedly failed. What is unusual about the case is that there is surprisingly little sympathy for Elsevier from the content creators that it profits from – the authors of papers it typically charges around $30 for access to. That is in stark contrast to music and video piracy issues, where the creators are typically against their copyrighted material being passed on for free. The market for publishing research papers in specialist journals has long resisted the economics of the internet age by building paywalls around their archives. When that approach proved successful, the publishers responded by raising prices – to the extent that top universities including Harvard have decided that they could no longer afford to pay the access fees. Worse, some journals are charging authors to have their papers published in the journals due to the perceived importance for a researcher's career to having their work independently recognized. In one case, Elsevier charges authors more than $2,000 to make their paper accessible to the public. Elsevier in particular has been targeted, with over 15,500 scientists boycotting the company's journals over its "exorbitantly high prices for subscriptions" and refusing to publish or do editorial work for the company until "they radically change how they operate." And in October, all six editors and 31 members of the editorial board for Elsevier linguistics journal Lingua quit over the high fees the company was charging for access. In this context, the enormous dump of free research papers has gained increasing notoriety in recent weeks and has resulted in a slew of articles about its owner, Kazakhstani researcher Alexandra Elbakyan. The Sci-Hub site has parallels to The Pirate Bay, but thanks to the intellectual component of the papers, and the different economics at play, it has been portrayed as a David versus Goliath battle. Elbakyan created the site in 2011 when she was unable to afford access to the papers she needed to carry out her research. "Payment of $32 is just insane when you need to skim or read tens or hundreds of these papers to do research. I obtained these papers by pirating them," she told Torrent Freak. The unofficial sharing of papers either directly through email, on internet message boards, or through Netflix-like sharing of passwords has become increasingly common. But the Sci-Hub site has applied modern internet technology and coding to the issue. The Sci-hub website acts as a search engine for papers. If there is not a copy of the paper already in the LibGen database, it uses access keys provided by anonymous academics (listed as "John Does 1-99" in the Elsevier lawsuit) and directs them straight to the paper, effectively bypassing the paywalls of a number of publishers, not just Elsevier. This is all done surprisingly quickly and then, to ensure that the same approach does not have to be taken for every request, it grabs a copy of the paper and adds it to the growing LibGen database – which, according to Sci-Hub, now contains over 47 million items. Sci-Gen's previous site was receiving 80,000 visitors a day. That took a hit when the domain was shut down following the injunction [PDF] and, according to Elbakyan, the new ".io" domain is currently received just 30,000 visitors a day, although she says that number is rapidly rising again. What is almost certain is that Elsevier will win its court case in New York. Elbakyan has failed to hire legal counsel despite repeated prodding from the judge. The company will almost certainly win millions of dollars in compensation since, by all accounts, the act of accessing the papers and posting them online is breaking copyright and hence is illegal. Elbakyan is unlikely to suffer the same fate as Aaron Swartz, however. Swartz was hounded and harassed by prosecutors for grabbing copies of more than four million articles through the network of the Massachusetts Institute of Technology (MIT), and ended up taking his own life after he turned down a plea bargain that would have seen him spend six months in jail. Elbakyan lives in Russia and so remains outside the reach of the US legal system. She is also likely to be able to do so indefinitely. She has remained defiant and refuses to back down, writing a letter [PDF] to the judge explaining her position and stating publicly that the site has back-up plans in case Elsevier manages to shut down its database or domains. "Elsevier is not a creator of these papers," she wrote to the judge. "All papers on their website are written by researchers, and researchers do not receive money from what Elsevier collects ... If a researcher wants to be recognized, make a career – he or she needs to have publications in such journals." As The Pirate Bay's running battle over internet domains shows, it is likely that Sci-Hub will be able to continue to operate online by simply jumping to a new address if and when the old one is shut down. Will it be enough to force Elsevier to change its business practices? Does Sci-hub represent a Napster-like tipping point for academic journals? Possibly.